There are many people today that never move forward because they constantly worry about making a mistake. And when fear enters the picture, well, that can stop everything! 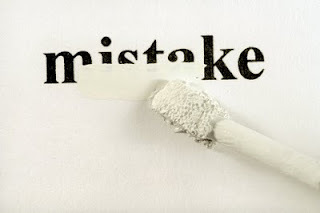 Confucius says "Be not ashamed of mistakes and thus make them crimes." Most of the things that we worry about don't even happen. Faith enables you to step out when there is nothing to step on to. Faith in God realizes that even if we fall, we have within us the power to get right back up and try again. So stop counting the reasons why you can't begin and jump out there with blessed assurance that God will help you every step of the way. You are going to have seasons when you make a mistake. Just consider it a mis-take and take it over! Have a great weekend!